Since they are no SQLite library that direct support Universal Windows Platform (Windows 10 app) currently yet, we are force to use the SQLite for Windows 8.1 instead. For those who use SQLite in Windows 8 / 8.1 app and wanted to upgrade their project to Universal Windows Platform, you may encounter th following message if you try to follow the tutorial of adding SQLite to Windows 8.1 project. “Why I never see the update post from my friend who everyone is discussing it now?” Does this sound too familiar to you? You know that you didn’t block your friend’s update but you just can’t found the update post on your news feed unless you go to that person’s profile / wall to see it. There are some changes in Facebook which I’m not sure when and how, but here is what you can do. [Update] In Google Chrome version 27, you need to check the Developer mode in the Extensions setting in order to install any user script directly. 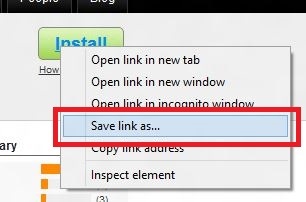 It is recommended to use Tampermonkey extension in Google Chrome to install any user script in the future because Google Chrome has place some limitations on how user script can access the resources in the iframe which cause a lot of problems in many user scripts that include MouseHunt Autobot. I have write a blog post on how you can install user script in Google Chrome through Tampermonkey Extension. This post is intended to help Google Chrome user on how to install or uninstall user script in their browser. Google Chrome version 21 had change the way how we can install user script. Now it only allow user script to be install in the Extensions page and web store but not from any tab opened. [Update]: I have found a solution to remove the markup area instead of hiding it. When you try to print your document in Microsoft Word 2013 (I’m now using Microsoft Word 2013 beta version), be warn that there maybe a huge blank space on the right hand side which is colored in light silver / gray color. This may happen when you have a long document. When I first encountered this problem, I was shock as there was no such blank space on the right in my document and the page layout was set correctly in Word. Later I found out that this blank area is call Markup Area where users can write their comments, highlights or changes at there. 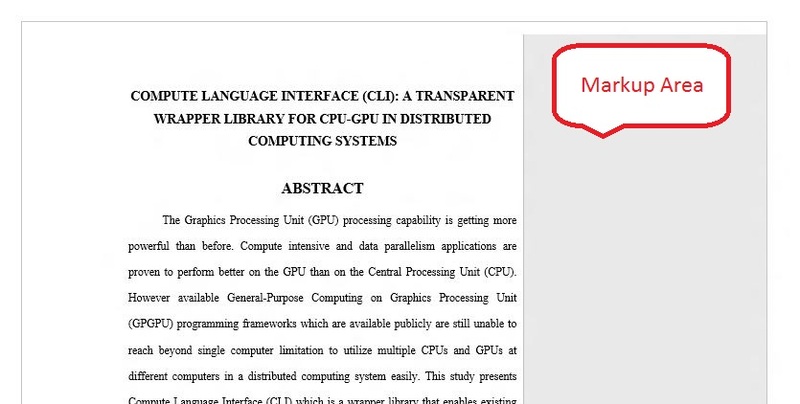 Although I didn’t write any comment there, yet the Markup Area show up every time I try to print the document. Wonder why it is so tricky to just get an URL to display RSS feed / Atom feed from a fans page. Anyway, here is a very simple 2 steps trick to get the URL for your fans page news feed update to RSS Feed or Atom Feed so that you can export to your blog or app. Short and simple, but I just wonder why Facebook don’t have this button to save all the trouble. 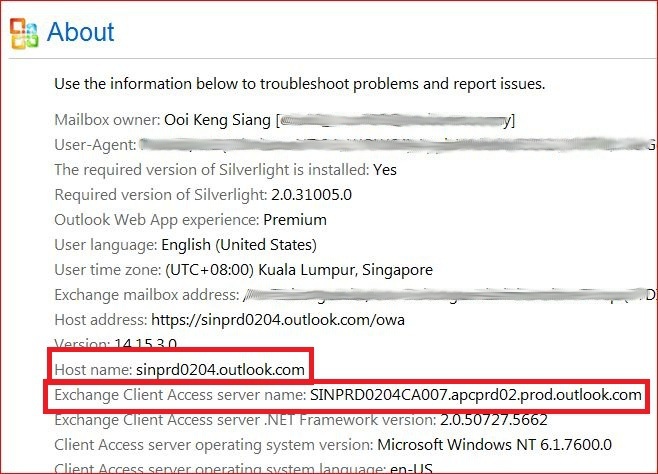 If you are a Universiti Sains Malaysia (USM) students and you have Microsoft Outlook 2010 installed on your PC. You might have the trouble connecting your Microsoft Outlook 2010 with your student mail, just like me. 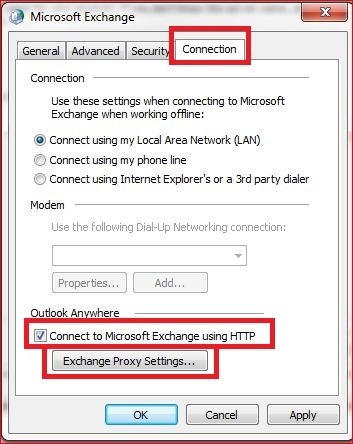 Thing get worse when the student mail fully migrate to Microsoft Exchange instead of hosting on live server which cause hotmail connector no longer work. I’m not going to use POP3 setting like the FAQ mention in USM Mail website, who the hack on earth still using POP3 anyway. 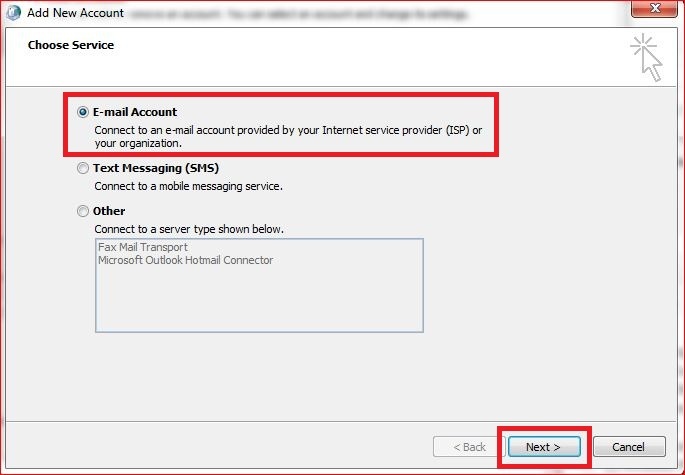 If you setup your Outlook to use IAMP for USM student mail like what I did previously, you will have a lot of trouble like confirm the certificate every time open Outlook or some time cannot connect to the server! Enough of the problems. Now I’m here to share how I’m able to fully connected to the mail server. 1. Close your Microsoft Outlook if is open (Install Microsoft Outlook first if you haven’t done so). 5. Select E-mail Account and click Next on the bottom. 6. 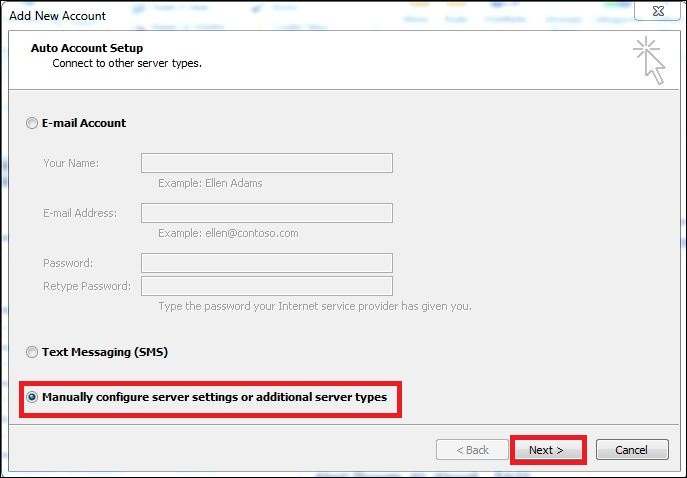 Select Manually configure server settings or additional server types and click Next on the bottom. 11. 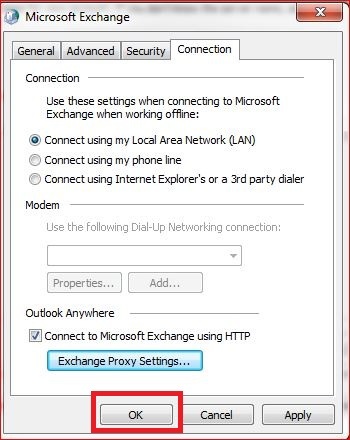 Click OK again to close the dialog for Exchange setting. 12. Now you can click on Check Name to see if all configuration is correct or not. If everything go right, you shall see a dialog pop up to call you enter the password. You shall see the Server and User Name changed to text with underline if all configuration success. Click Next. 13. Click Finish on the bottom and we are done! 14. Open your Microsoft Outlook and you will have your e-mail there. 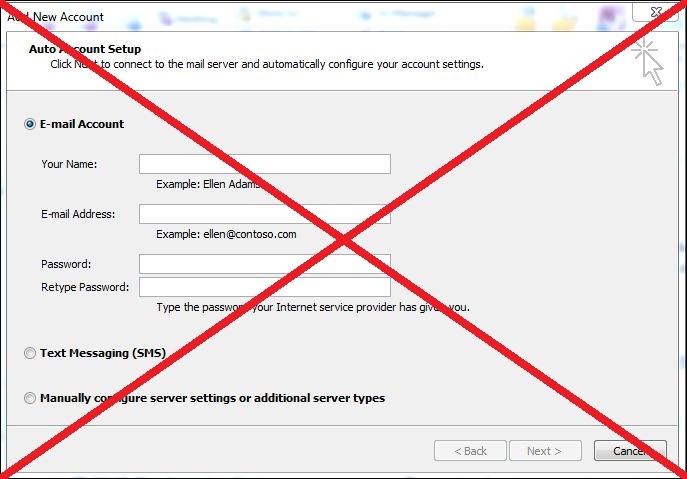 If you want to know how to get the server name and proxy server name. Here is how you get that. 1. Login to your email through web browser. 2. Click on the help icon and select About. 3. 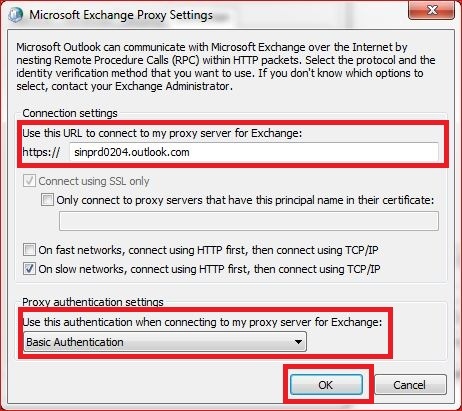 Exchange Client Access server name is the server name for the mail box and Host name is the proxy server name for login. 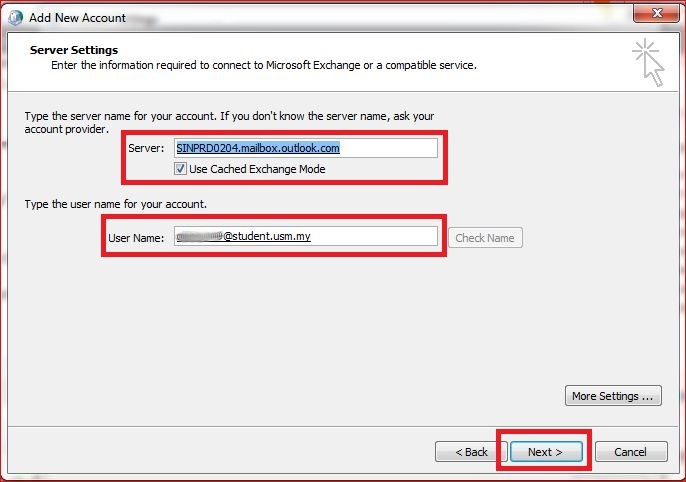 The major problem for USM student mail is they use Microsoft Exchange server by still using live ID for authentication. 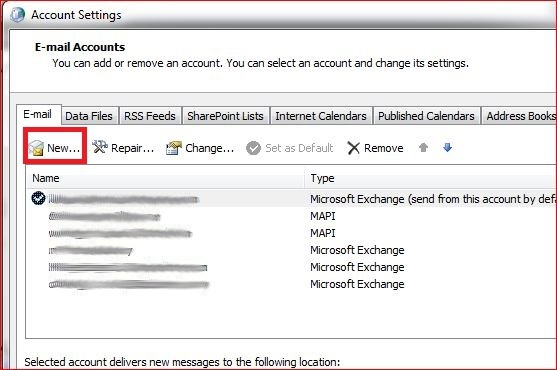 Thus by using default Microsoft Exchange Server setting or Live Mail setting will not work at all. I’m very disappointed on how USM provide support on their e-mail service. After long explain on how great they now move to a new server but tell user to use POP3 setting. Then what is the point offering calendar service while we only can use POP3 setting for Outlook? P.S. 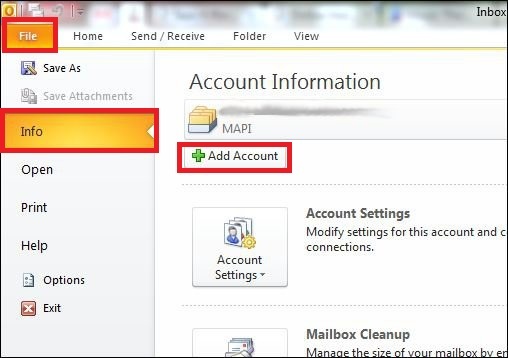 : Using Windows Live Mail program for USM student mail will only allow you to receive e-mail but it won’t be able to send out e-mail due to Windows Live Mail program only support SSL connection while USM student mail require TLS connection. You might notice Opera actually did not allow user script to run on secure page (page with https address) by default, but we need this in order to run user script on our game in Facebook which now can be run on a secure connection or https. You will need to restart your Opera browser to make it work (simply close and re-open back the Opera browser). You should see the dialog box below. just click Yes and you can now execute user script on https. This problem had bugged me for a few days bacause the code I written was working previously but not now. Search up and down but I can’t found any solution especially Opera is not commonly use by most people. I use the following code to play music at the background for other browsers like Firefox and Google Chrome, they work flawless but not on Opera browser for the latest version 11.50. I reinstalled Apple Quick Time and Opera for a few time and nothing since to fix the problem at all. After some random testing and almost given up, I found the problem and solution. Opera latest version won’t play any music / sound / video if the hidden is set to true! Yes, that all, just because of the small changes and it screw me up for one whole week. But I still want to play the music / sound without letting people to see the player / control, so I use following code to achieve the same thing yet work on the latest Opera web browser. Hope the information is helpful for those who had trouble with Opera web browser. Opera had lot of problem with the embed tag, I still can’t found a way to let the Opera continually play the music even I set loop to true. If you know how, do tell me in the comment, thanks. 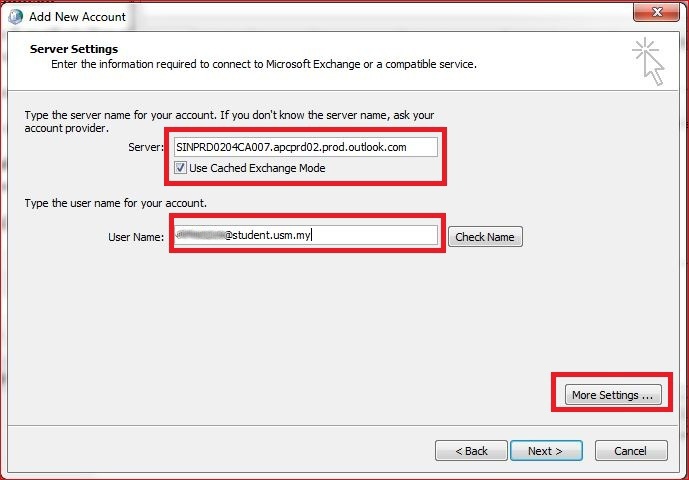 If you are a Universiti Sains Malaysia (USM) students and you have Microsoft Outlook 2010 installed on your PC. You might have the trouble connecting your Microsoft Outlook 2010 with your student mail. 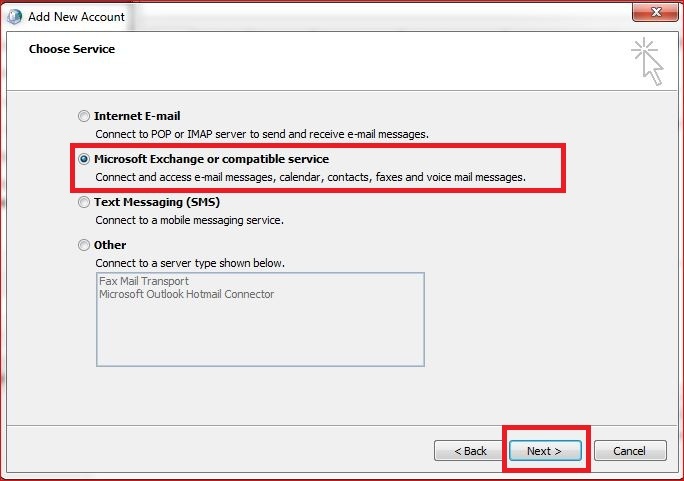 Although USM student mail can be access through http://mail.live.com just like other hotmail or live mail, but direct enter your e-mail address on outlook like hotmail or live mail will not work in Microsoft Outlook 2010. Your probably had search through http://student.usm.my/ for an answer for this problem but end out with no solution other than just using POP3. I personally dislike POP3 as it download the all mails from your inbox and it will not sync with your mail box online after that. 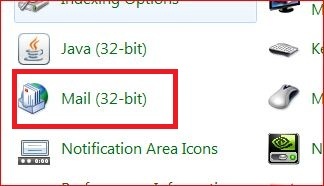 I prefer IMAP which allow my outlook to sync with my mail online so that I can continue my work on e-mail through web browser on other PC without worry that what I see is different on my outlook. So how we do the trick using IMAP on Microsoft Outlook 2010? It is very simple. Step 1: Go to File on top of your menu and click on Add Account. 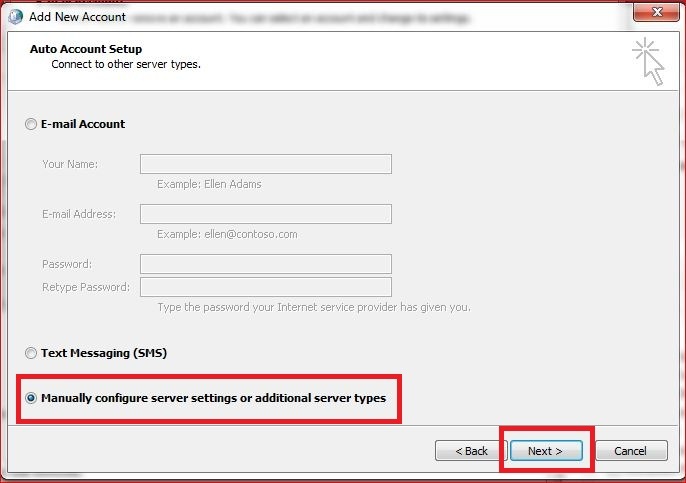 Step 2: Select Manually configure server settings or additional server types instead of E-mail Account. Then click Next. 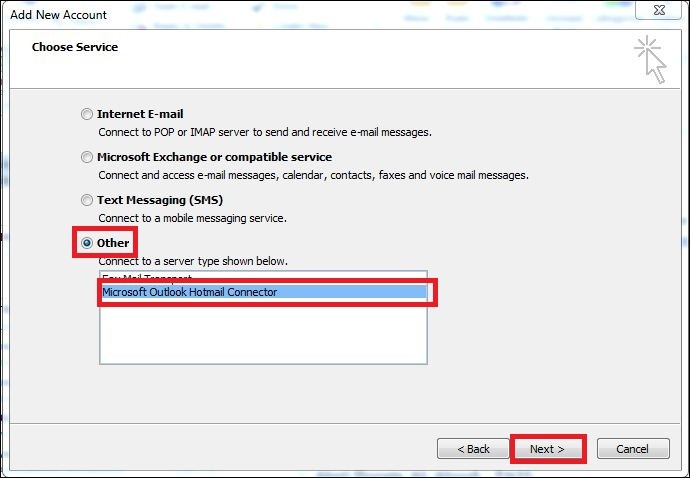 Step 3: Select Other and choose Microsoft Outlook Hotmail Connector. 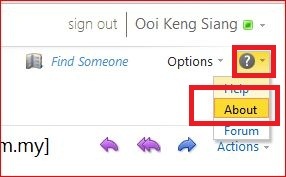 If your Outlook does not have Microsoft Outlook Hotmail Connector, just do a simple search on Bing, you should get the installer very easy. Then click Next. 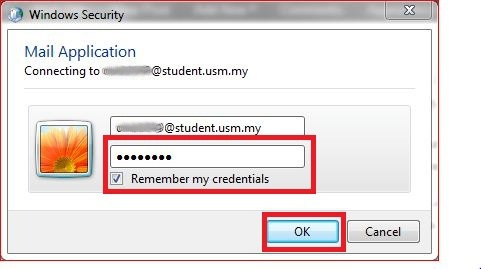 Step 4: Enter your name, your student e-mail address and password. Then click OK. 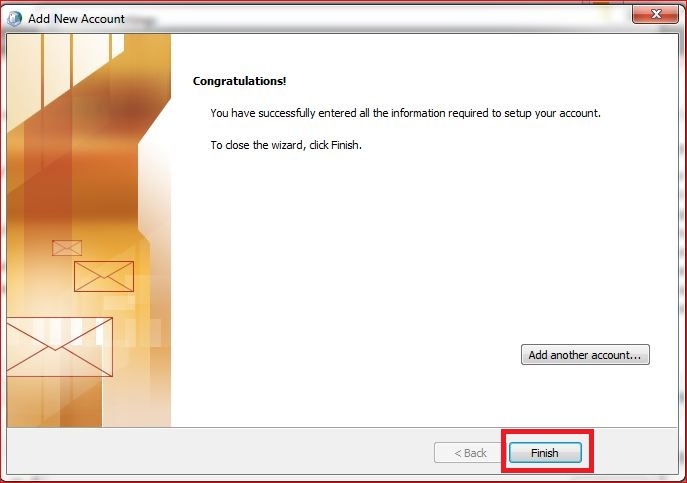 Step 5: Done, we had finish setting up the account. 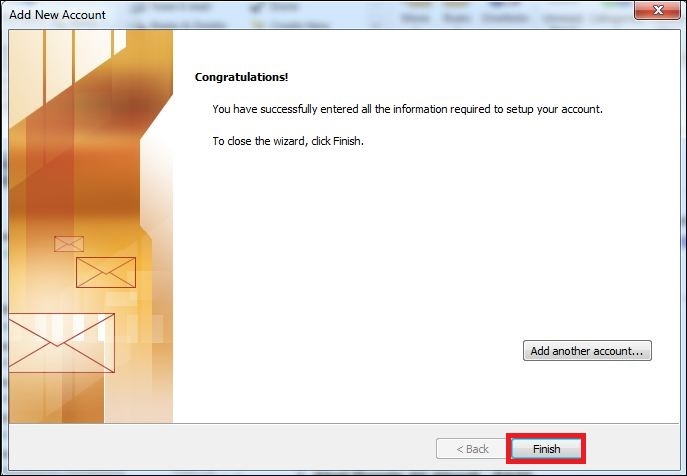 Just click Finish and start access your student mail through Microsoft Outlook 2010. Aren’t it is simple? Just wondering why Microsoft Outlook 2010 cannot automatically do the trick instead.